Who doesn’t wants to stay fit? In a healthy body resides a healthy mind. What is a better way to stay fit than do some outdoor adventurous stuff. Especially water sport, where you can feel that rush of adrenaline and also the thrill of water. 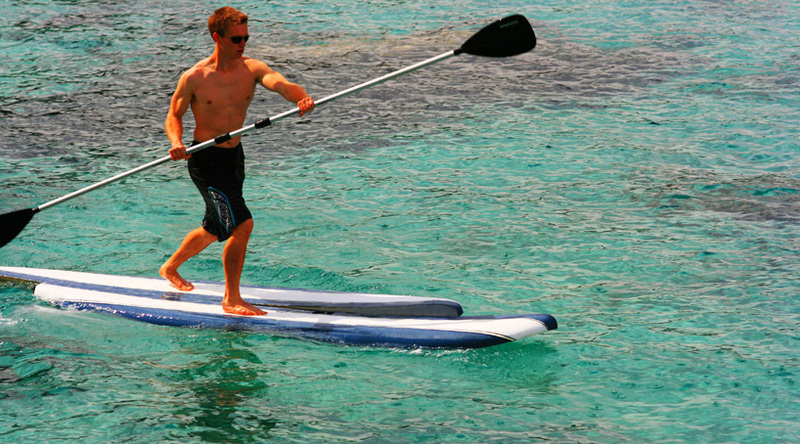 There are numerous water sports that can help you retain your best form like river rafting and kayaking. While these sports are great exercises in themselves but they mainly target on the upper half of the body, strengthening your arms and chest muscles. In this situation no excess focus is provided for the lower body muscles. 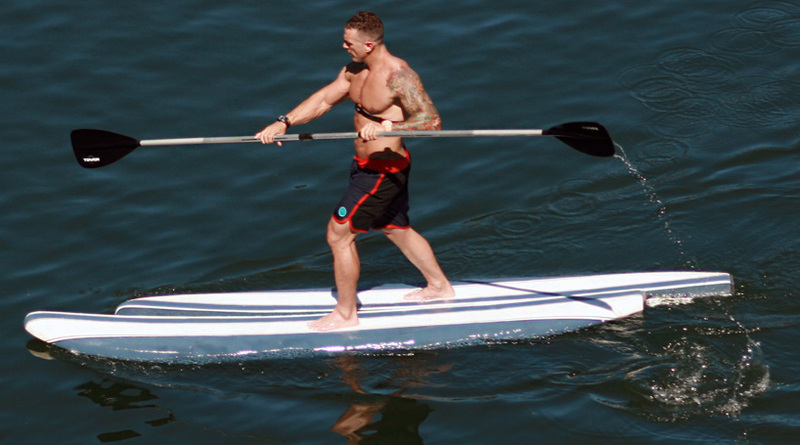 Well you can fit a pair of pedals in your kayak but this is an impossibility if we talk about paddleboards mannered by standing up. Maintaining the balance will be a lot more difficult. So a group for designers followed an entirely different approach to develop Peleboard, which will let you focus on your lower body muscles also. It has a very peculiar design when it comes to the structure. The entire board is made up of carbon fiber which makes it extremely light weight. The board in split in the middle along the midriff. These two disjoint semi portions are connected to each other using a stainless steel slider with ball bearings that enables it to slide smoothly. To provide additional support underneath both the halves there are scute-style flaps. The locomotion follows a series of steps which allows the rider to manipulate its movement accordingly. If the rider wants to float in forward direction, that particular side of the board moves first. The water exert pressure on the flaps of the board to fold up against structure of the board providing the required assistance for maneuvering. When the other side’s turn comes up to take charge the flaps on the first side fold down again, which allows the board to maintain the balance and stay in place. 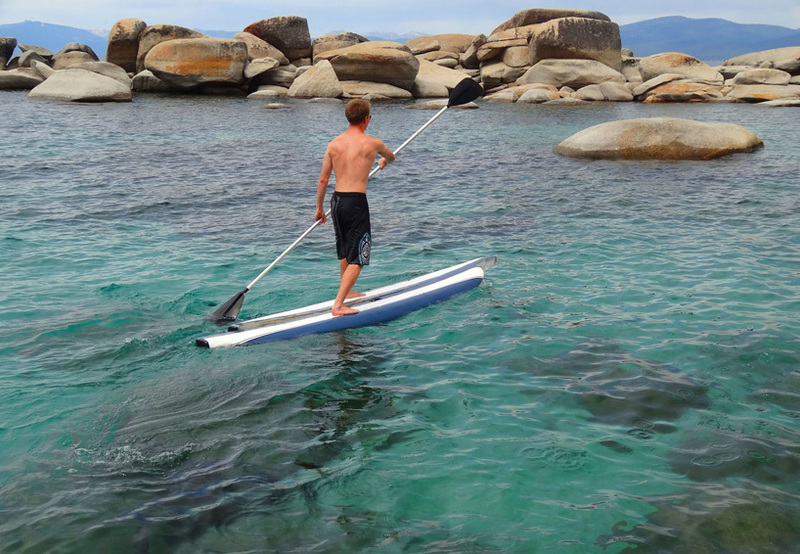 The movement of the flaps allows the board to catch up the water and provide all the necessary support and balancing factors needed to operate the Peleboard. It provides quite a challenge to wade across a water stream using this technique so to make it a little bit simple a double bladed paddle is also provided if the rider wishes to paddle across. If a user wants to use the paddling option the boards will be locked together to facilitate its functioning. This ingenious design was the idea of Blake Knutson, co-founder of the company Pele Paddleboards. He is planning to raise funds for the production of Peleboards through a Kickstarter campaign, which is assumed to be taking place in the next spring season. Currently there is absolutely no wind regarding the price of this amazing board. But customers can draft a rough sketch of the estimate of the price by considering the parts and materials used in the construction of this board. What I perceive is that this board will not come as a heavy burden on your pockets!